Christine Richard on the 'Herbalife (HLF) business' that isn't a business. More than half a century of quantifiable evidence, proves beyond all reasonable doubt that what has become popularly known as 'Multi-Level Marketing' is nothing more than an absurd, cultic, economic pseudo-science, and that the impressive-sounding made-up term 'MLM,' is, therefore, part of an extensive, thought-stopping, non-traditional jargon which has been developed, and constantly-repeated, by the instigators, and associates, of various, copy-cat, major, and minor, ongoing organised crime groups (hiding behind labyrinths of legally-registered corporate structures) to shut-down the critical, and evaluative, faculties of victims, and of casual observers, in order to perpetrate, and dissimulate, a series of blame-the-victim closed-market swindles or pyramid scams (dressed up as 'legitimate direct selling income opportunites'), and related advance-fee frauds (dressed up as 'legitimate training and motivation, self-betterment, programs, recruitment leads, lead generation systems,' etc.). Are Investors Underestimating The Risks To Herbalife's International Business? While investors seem complacent about the operation of Herbalife’s business outside of the US, we believe a pattern of sales into unopened markets creates undisclosed risks. Our research found numerous instances of Herbalife distributors and third parties selling into supposedly unopened markets, among them Ecuador, where we saw evidence of 60,000 Ecuadorians registered as US distributors. That raises uncertainties about Herbalife’s compliance with customs, tax and health regulations around the world and poses more questions about the deceptiveness of the business opportunity. LifeVantage, a Utah-based MLM, recently concluded an investigation into its international sales practices – including sales in unopened markets – resulting in a crackdown and a drop in sales. Nearly seven months ago, we wrote about US Customs data that indicated Herbalife Ltd. (NYSE:HLF) had shipped the equivalent of 32 million canisters of Formula 1 to Lebanon in 2014. Herbalife told us the data should not be relied upon, yet, the third-party data remained uncorrected for months after it was brought it to Herbalife's attention. You can read about the issue here. Since the article ran on May 26, Datamyne, which provides information on US exports by company, still has not received any information from Customs or Herbalife that would allow it to correct the Lebanon shipment information, according to a company representative. As a result, Datamyne's database continues to indicate that Herbalife made hundreds of shipments of its products from the US to Lebanon via the Netherlands. Lebanon remains, according to Datamyne, Herbalife's largest export market in 2014. After the article ran, one person put forward a theory about where those Lebanon-designated shipments ended up, which we share below. We don't know if his explanation is correct, but it raises an important question for shareholders and one that we have been pondering since we began our research on the company: Does Herbalife have a smuggling problem? I do you a favour by identifying the Lebanon issue. a. The only Middle Eastern country in which Herbalife operates is Israel and I think Lebanon. b. There are herbalife clubs throughout the middle east - mostly set up by migrant workers. I went to one in Doha (Qatar). The product was consumed happily and shipped the country by the workers who run the clubs. c. The route for shipping used to be through Lebanon. Members ship it on there own. d. A war in Syria closed that route off. It probably goes through the subcontinent now. Just explaining for people who do not travel much in that part of the world. We've seen evidence of that as well, and the problem here is that it's not as innocent as it might seem for Herbalife products to end up in markets in which Herbalife isn't officially registered. For starters, when a company is not formally doing business in a country, but its products are making their way across that country's borders, it raises the possibility that customs and taxes aren't being properly assessed and paid. Governments tend to take a dim view of that. Mr. Hempton's explanation also seems to exclude Herbalife from any active role in the unauthorized business: Herbalife doesn't make the shipments into these unopened countries, but rather migrant workers do, he says. That narrative just doesn't hold up. First, the Datamyne data show that Herbalife was the shipper on the Lebanon-designated transactions, so one can assume, under Hempton's scenario, that the company or its representatives were aware that Herbalife was sending an extraordinary number of shipments into the Middle East. If the shipments did indeed go to Lebanon, then it seems that either: 1) Lebanon had become a massive market for Herbalife products, good news which one would have expected the company to share with its investors, or 2) Lebanon had become a gateway into other markets. As a multi-level marketing company, Herbalife must be more aware of who is buying its products and where they are located than your typical consumer products company. After all, Herbalife's products are attached to a business opportunity. It's not just the products that are smuggled into unopened markets, but the business opportunity as well. In order to manage that business opportunity, Herbalife oversees a complex system that records sales and tracks wholesale commissions, royalty overrides and production bonuses owed to layers of upline distributors on every sale. If distributors are operating in unopened markets, Herbalife has to figure out how to classify, track and pay them. Our research indicates there is a well-established system for doing just that. We've talked to numerous former Herbalife employees and distributors who have described a pattern of Herbalife products getting into markets before the official opening. This occurs even though recruiting in, selling in or even prepping a market through advertising prior to the official opening is forbidden under Herbalife rules. Here's how former employees have explained the process to us: Top distributors recruit new distributors in a closed country, signing them up with Herbalife as residents of an open country, for example the US. These recruits place their orders and have products shipped to a freight forwarding company in the US, which then consolidates the orders and sends them into the closed country. We have heard repeatedly over the course of our research that Herbalife pays distributors operating in unopened countries as if they were US residents. Herbalife withholds taxes on these payments as if it were paying US residents. Later, the distributors file forms with the IRS certifying that they are not running a business in the US and get the withheld amounts refunded. This creates a hard-to-follow paper trail. If distributors are operating a business in a foreign country, they should owe taxes there. But how do local tax authorities know about this income? Herbalife's willingness to sign up distributors and pay them in the US, knowing that they don't actually operate a business there, makes it easier for the company's distributors to evade taxes in the countries in which they are actually operating. Herbalife has never, to our knowledge, detailed the early market opening process for its investors. From the outside, it appears that Herbalife sets a date for a new country opening, gets its infrastructure and all necessary approvals and product registrations in place and then on "Opening Day" fires the starting gun, setting off a frenzied but fair scramble to recruit and sell in the new market. Yet we've stumbled upon, as Mr. Hempton did during his trip to Qatar, example after example of a different process. At the very beginning of our research, back in 2011, we watched an online presentation by a top distributor in Mongolia. She told the audience how her Nutrition Club network in Mongolia had grown from six clubs at the end of 2008 to 65 by the end of 2009 and 100 as 2010 drew to a close. She didn't mention that the Mongolian market wasn't officially opened for business until 2011. In the upper corner of the documents she displayed, the name of her sponsor and fellow beneficiary of all this pre-opening activity, Herbalife Founder's Circle Member Leon Waisbein, was visible. During a phone interview, a distributor in Trinidad & Tobago explained to us how distributors set up their businesses in that country in the years before the official opening, arranging for freight forwarders to bring products in through Jamaica. This distributor and his organization, which included 5,000 distributors and 240 Supervisors, received US-dollar checks by mail for any commissions or bonuses they were due from Herbalife and were treated as US distributors by the company, which withheld US taxes on those payments. The distributors later filed for and received refunds from the IRS by certifying that they did not live and work in the US. When the Trinidad market officially opened, all the distributors operating in that country were converted from US distributors into Trinidad distributors, and Herbalife began withholding taxes on behalf of the Trinidad government rather than the US government. This mass conversion suggests Herbalife was aware that the distributors it had been sending checks to in Trinidad were actually working their businesses in Trinidad. We attended a presentation in Ecuador at which a former airline hostess told the story of how her upline - the now-deceased Mexican Founder's Circle member Eduardo Salazar - sent distributors into just about every Latin American country before the opening to get a foothold and build a downline in those places. A former employee described for us watching as country after country in Eastern Europe was opened through unofficial channels, leaving him and his fellow employees with questions about the compliance of the business under numerous local laws. Those who tried to bring the issue of early openings to the attention of Herbalife management found they were uninterested in fixing the problem, according to the employee. We later viewed a document showing that Herbalife was aware that third-party logistics companies had created distribution networks in a number of these unopened countries. Kazakhstan, for example, had walk-in sales centers in 12 cities, according to the document, though it wasn't officially opened for business. The document also indicated that third parties conducted all sales in cash, refusing to take credit cards, as some of these third parties were not properly registered with local tax authorities and, as a result, sought to avoid interactions with the banking system. In addition to tax and customs issues, the shipping of products across borders by distributors and others raises product registration issues. Obtaining approval to sell nutritional supplements in many countries is an expensive, years long process and not one an individual distributor would likely be able to orchestrate. A Venezuelan distributor who sold products in Guatemala prior to the official open told us that the company's protein shakes had to be brought across the border from Mexico for years because Guatemalan health authorities had not yet approved the products as safe for consumption. Perhaps the most blatant example we encountered of products being sold in a country ahead of a market opening took place in Ecuador. Herbalife announced the official opening of the Ecuador market in 2008, yet interviews and internal documents we viewed show distributors exported millions of dollars of products from the U.S. into that country in the years before the official opening. Herbalife not only permitted this activity; it tracked it, according to those documents, which show that, by the time the market officially opened, Herbalife already had 24,162 Ecuadorian distributors registered in its database and another 37,899 "desertions" or distributors who had signed up but stopped ordering. Herbalife didn't ship directly to Ecuador during this period, but rather shipped huge amounts of products to a handful of addresses in Miami, New York and Illinois, where the products were consolidated by freight forwarding companies and sent on to Ecuador. Ecuadorean distributors were initially entered into Herbalife's tracking system as US residents. Later, after the market formally opened, Herbalife converted these "US distributors" to Ecuadorian distributors. On the day the market officially opened for business, Ecuador already had nine President's Team members. Meanwhile, new recruits who signed up on the first official day of business, believing that they were getting in at the start of an opportunity, had already lost the race. This is another issue with early market openings - they disadvantage recruits and deceive them about their already slim chances of success. Respondent is very proud of the 10 cars (including a Mercedes Benz SUV, MBW, Tesla, Fisker, Ferrari, Maserati, 2 Bentleys and Rolls Royce) and 4 motorcycles we currently own. I believe we have business interests in no less than 18 different business entities, including Herbalife interests in Dubai, Japan, Korea and Vietnam." We sent questions to Herbalife regarding the status of its business in Qatar and mentioned John Hempton's observation that Nutrition Clubs are operating across unopened markets in the Middle East. Herbalife told us it believed that John Hempton's observations were not accurate. We also received some documents from Herbalife purporting to show that product had not been sent to Lebanon. These documents contained information about shipments with transaction numbers that matched the transactions Datamyne identified as bound for Lebanon. The documents stated that the final destination of the shipments was the Netherlands. We sent Herbalife some follow-up questions to try to determine how and why these documents differed from the ones used by Datamyne to create its database and whether the documents had been submitted to Customs but never got a response. The specifics of Herbalife's international business, in all those far-flung locations, may seem easy enough to ignore. But as investors in LifeVantage Corporation (NASDAQ:LFVN), a Utah-based MLM, learned last week, questionable practices, even when they happen beyond US borders, present a very real risk. LifeVantage was forced to delay the release of its financial statements for several months and conduct an investigation after employees in its tax department raised concerns about how the company's products were purchased and sold in some international markets and the impact of those practices on taxes and tariffs associated with the sales. "The type of activities reviewed included our products being purchased for personal consumption and being taken into markets where they had not been approved for resale," Gary Mauro, LifeVantage's Chairman of the Board, said during a December 13 conference call. As a result of the investigation's findings, LifeVantage has cracked down on certain practices, affecting about 8% of sales, according to management. This, in turn, has led to a weakening of the company's sales. LifeVantage's assessment that 8% of revenue or around $17 million in sales in fiscal 2016 were linked to questionable international sales practices is significant. That amount represents 100% of the company's revenue growth over the prior year. LifeVantage reported revenue of $207 million in 2016, up $17 million from $190 million in 2015. Allowing distributors and third parties to pre-open markets and move products across international borders has likely lowered the cost of expanding Herbalife's business to nearly every corner of the world. That's because top distributors and others have established the business in unopened countries at their own expense and risk. · It's unfair and deceptive to allow top distributors to open markets early. · It's illegal to sell products that haven't been approved by health authorities. · It's fraudulent to evade taxes and custom duties. · It's poor practice to routinely sign up distributors in countries in which they don't operate as that facilitates income tax evasion. · It's unconscionable to put migrant workers in the position of violating laws, particularly in Middle Eastern countries where penalties for lawbreakers can be extraordinarily harsh. · It's an omission of material facts not to share an expansion process and its risks with your investors when that process has been repeatedly employed to open market after market around the world. But maybe it's not such a mystery why Herbalife doesn't want to talk more about that Lebanon data. 'MMM Mavrodi Mundial Moneybox' - A cultic racket collapsing in Nigeria. Many Nigerians were thrown into panic in the morning of Tuesday, December 13, 2016, as the popular pyramid scheme, Mavrodi Mundial Moneybox, MMM, shares confusing message on its website stating that it has frozen all confirmed Mavros, otherwise known as money due for withdrawal for one month. This means, all the accounts of members who are due to be paid after having ‘provided help’ (PH) to another person since the last month have been frozen and hence, have no access to request for payment, known as ‘Get Help’ (GH) until after one month. All members woke up with the shock message displayed on the screen as soon as they logged into their accounts. Giving reasons for freezing the Mavros, the scheme said it is experiencing heavy workload and want to deal with the attacks coming from the country’s mass media. It also said it wants to prevent hitches in the coming new year hence, the freezing of the access to requesting for payments even when such person is due for payment. mmm freezing notice mmm freezing notice The message read thus. As usual, in the New Year season the System is experiencing heavy workload. Moreover, it has to deal with the constant frenzy provoked by the authorities in the mass media. Hence, on the basis of the above mentioned, from now on all confirmed Mavro will be frozen for a month. In a Whatsapp group, MMM Nexus Solution, members of the ponzi scheme, many who are guilders, have launched their displeasure over the new development. Many have lamented that they don’t know how to communicate the development to their downliners – those they persuaded to stake their money in the ponzi scheme. They also argued that this decision of the scheme’s management will trigger the downfall of the scheme. They said most people will hence, be skeptical in staking their money while a good number of them said such decision is selfish and would have been better if it was conveyed to members before now. The Securities and Exchange Commission (SEC) and the Central Bank of Nigeria (CBN) have, at several times, warned Nigerians against participating in the scheme while the house of representatives also ordered an investigation into the operation of the scheme, in October. According to Wikipedia, МММ was a Russian company that perpetrated one of the world’s largest Ponzi schemes of all time, in the 1990s. By different estimates from 5 to 40 million people lost up to $10 billion. The exact figures are not known even to the founders. MMM took its name from its founder, Mavrodi. He founded MMM in 1989 and the scheme was declared bankrupt three years later leading to the disappearance of Mavrodi until his arrest in 2003. He was convicted in 2007 in his home country of defrauding 10,000 investors out of 110 million rubles, the equivalent of $4.3 million. MMM is not his first ‘wonder bank’ creation. MMM collapsed in Zimbabwe in September 2016 leaving thousands of people, among them civil servants and vendors, with thousands of dollars trapped in the ponzi scheme. Sergey Panteleevich Mavrodi, a Russian convicted criminal and a former member of the State Duma. Millions of Nigerians risk losing huge amounts of money they put in the Mavrodi Mundial Moneybox (MMM) scheme. The Mavrodi Mundial Moneybox scheme administrators of the scheme early Tuesday announced the freezing of the subscribers’ monies for one month. Members of the Ponzi scheme who were due to withdraw both their capital and 30 per cent return on investment, will have to wait until sometime in January 2017. Millions of Nigerians risk losing huge amounts of money they put in the Mavrodi Mundial Moneybox (MMM) scheme. The Ponzi scheme is suspected to have crashed. Barely 24 hours after its founder Sergey Mavrodi, wrote to the Nigeria government, criticising the latter’s constant attacks on the scheme, MMM deferred meeting its obligation to its clients. The administrators of the scheme early Tuesday announced the freezing of the subscribers’ monies for one month. Consequently, members of the Ponzi scheme who were due to withdraw both their capital and 30 per cent return on investment, will have to wait until sometime in January 2017. A statement posted on the MMM website said: “As usual, in the New Year season, the System is experiencing heavy workload. “Moreover, it has to deal with the constant frenzy provoked by the authorities in the mass media. 'MMM India,' another, unoriginal, contagious fantasy of Sergei Mavrodi. The lie which is fundamental to all 'closed-market swindles' is that people can earn income by contributing their own money to participate in any alleged 'profitable commercial opportunity' which is secretly an economically-unviable fake, due to the fact that the alleged 'profitable commercial opportunity' has been rigged so that it generates no significant, or sustainable, revenue other than that deriving from its own participants. For more than 50 years, 'Multi-Level Marketing' racketeers have been allowed to dissimulate closed-market swindles by offering endless-chains of victims various banal, but grossly-over-priced, products, and/or services, in exchange for unlawful payments, on the pretext that 'MLM' products and/or services, can then be regularly re-sold for a profit in significant quantities. However, since no gang of 'MLM' racketeers has ever proved that 'MLM' wampum has actually been regularly re-sold to the general public for profit in significant quantities,'MLM' participants have, in fact, been peddled infinite shares of their own finite money. In the final analysis, other than their ephemeral external presentations, internally there is no real difference between all closed-market swindles; for any alleged 'opportunity to make money,' wherein (when challenged, and/or rigorously investigated) the promoters are unable to provide independent quantifiable evidence to prove that their alleged 'viable commercial activity' has had any significant, and sustainable, source of revenue other than its own losing participants, is self-evidently a dissimulated closed-market swindle. If you search for Sergei Mavrodi on Wikipedia, you will find him initially described as a Russian 'businessman and financier.' However, the only truthful part of this exciting comic-book story is the fact that he was born in Russia; for, in reality, he is (without a shadow of a doubt) a megalomaniacal psychopath . Sergei Panteleevich Mavrodi is suffering from a chronic mental disorder resulting in paranoid delusions of grandeur and self-righteousness, and the compulsion to pursue grandiose objectives. Classically, Mavrodi believes himself not only to be a historically significant businessman and a financier, but also a morally, and intellectually, perfect Russian super hero who has been chosen to free humanity from the slavery of the evil world financial system. Indeed, if you watch the above video from 2011 (in which Mavrodi quite-openly admits that he is on a mission to destroy the pyramid scheme known as the world financial system and that his chosen weapon of mass-financial-destruction, is another, even more powerful, pyramid scheme), it beggars belief that he is not already locked up in a secure hospital. 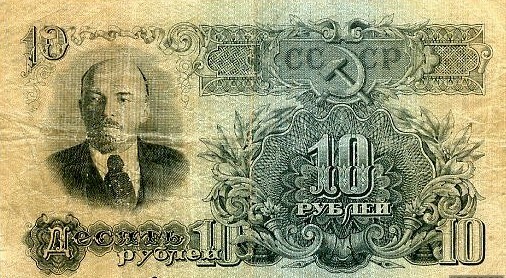 In the aftermath of the unexpected fall of the Soviet regime (which left millions of ordinary Russians, particularly pensioners, facing destitution as the buying power of the once-protected rouble collapsed, and hyper-inflation took-hold) Mavrodi (an importer of office equipment) stepped-forward in the role of economic saviour and instigated what was soon to become one of the most-extensive closed-market swindles of all time, known as 'MMM.' http://en.wikipedia.org/wiki/MMM_(Ponzi_scheme) . It has been estimated that between 1992 and 1994, 30 millions ill-informed Russians were deceived into giving a total of several billions US dollars to Mavrodi and his criminal associates, in the deluded belief that they were all going to receive a future reward of 1000% (to be paid annually). Typically, Mavrodi began to make the truth increasingly unthinkable, by using some of his ill-gotten gains to buy media advertising (including a series of humorous television commercials) as well as obtain public association with popular Russian sports, charities, celebrities and opinion-makers. In 1994, Mavrodi's offices were raided and he was arrested for tax evasion, but although millions of angry victims were left out of pocket, he avoided being held to account by getting himself elected to the Russian parliament. During his election campaign Mavrodi steadfastly pretended that the Russian government was trying to destroy 'MMM' in order to steal the company's money, and that 'MMM' investors would only be paid out if he could influence the government from inside the political system. However, no pay-out was forthcoming, and Mavrodi's immunity from prosecution was cancelled in 1995. 'MMM' was finally declared bankrupt in 1997. Mavrodi then went of the run until he was arrested in 2003. During this time, he spread a rumour that he'd gone to USA. In reality, he'd probably never actually left Russia. Indeed, it is now believed that Mavrodi had been hiding in Moscow, protected by a well-rewarded gang of former Soviet intelligence agents/thugs/racketeers who had access to a labyrinth of safe-apartments. With the help of a relative, Mavrodi instigated another closed-market swindle in 1998, this time known as 'Stock Generation.' His new scam was nothing less than an Internet-based counterfeit stock market. http://en.wikipedia.org/wiki/Stock_Generation, but it was dissimulated as a 'lawful gambling game' and was targeted at greedy Americans and W. Europeans. Largely because of its deliberately-incomprehensible linguistic, and mathematical, presentation, the essentially-simple closed-market swindle known as 'Stock Generation,' initially duped a United States District Court in Massachusetts, but it was closed-down by the United States Court of Appeals, when common-sense was finally applied in 2000. Few of Mavrodi's estimated 20 000 and 275 000 victims, complained even though they lost a estimated total of at least US$5.5 millions. Following his arrest in Russia in 2003, Mavrodi was initially sentenced to 13 months prison for holding a false passport. He was subsequently convicted of fraud and tax evasion, and was released from a penal colony in 2007. There are even 'Mavro' coins. Amazingly, Mavrodi openly-admits that 'MMM 2011/ India' is a pyramid scam. He is widely-quoted as saying : 'It is a naked scheme, nothing more ... People interact with each other and give each other money. For no reason! 'However, since Mavrodi's 'MMM' organization has exhibited the universal identifying characteristics of a cult, his activities are neither original nor unique and, consequently, they cannot be fully-understood in isolation. Erich Hermann Wilhelm Voegelin (1901-1985), was a gifted German academic, who, in the decade preceding WW II (working largely-alone), produced an insightful explanation of ‘Nazism’ as a form of perverted religion or cult. Sadly, during the 1930s, few people took much notice of Eric Voegelin. Whilst teaching political theory and sociology at the University of Vienna, he published two books, ‘The Race Idea in Intellectual History’ and ‘Race and the State’. In these, he pointed out the elementary, mistakes which invalidated various, popular ‘racial theories’. In 1938, Voegelin (aged 37) tried to publish 'The Political Religions'. In this, he focused on contemporary totalitarian ideologies derived from the ‘racial theories’ which he’d previously criticised as absurd pseudo-science. He now pointed out the glaring structural similarities of these ideologies to religions. Courageously, Voegelin was comparing medieval pseudo-sciences and 'Gnostic' cults to the 'Völkish’ or ‘Pan-German’ movement and its terrifying post-WW I incarnation, the 'Nazi party'. 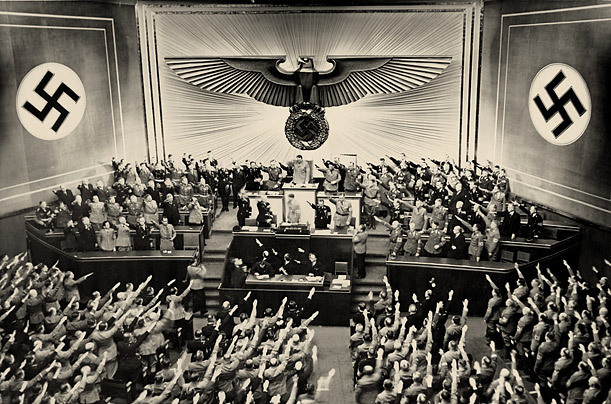 In 1938, the ‘Nazi’ leader, Adolf Hitler, had held absolute power in Germany for almost 5 years. He had just taken control of Austria. The self-gratifying ‘Aryan Master Race’ delusion was spreading like a virus. In essence, Hitler controlled his fanatical core-adherents with a comic-book story in which he was a morally and intellectually perfect Aryan super hero, the 'führer,' on a mission to save his 'noble race' from the slavery of the world financial and political system which was controlled by an 'evil secret society of sub-human Jews, Freemasons,' etc. The dozens of books, essays and reviews which Eric Voegelin published during his lifetime, are almost impossible for the average person to take in. 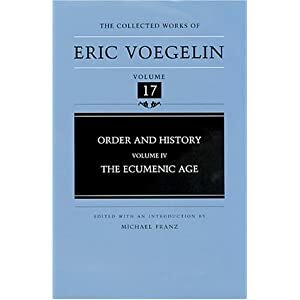 To give readers some idea of the scale of his thinking, Voegelin’s Major work, ‘Order and History’, began to be published in the USA in 1956 when he was aged 54, but it remained unfinished when he died 31 years later. In simple terms, Voegelin was as a philosopher-historian who took an elevated, and broad, view. He observed that, throughout human history, there have been periods of mass-alienation... following wars, revolutions, plagues, natural disasters, economic depressions, etc. ... during these periods, dangerous manipulators (acting like ancient, Gnostic Prophets by pretending moral and intellectual authority and offering some form of Utopian existence in the here and now) who at other times might be dismissed as absurd crackpots and charlatans, have found it much easier to become accepted as authentic Messiahs and to acquire a mass-following. Thus, Voegelin, not only described, but also predicted the arrival of the latest generation of economic alchemists,like Sergei Panteleevich Mavrodi.